Alhambra Instituto offers DELE preparation of 2-4 weeks for all levels (A1- C2). A high percentage of students, who come to our school to prepare it, pass the exam (98%). The Spanish certificates DELE are internationally recognized, and they are highly regarded, not only among public and private institutions and educational authorities, but also in the business world and among chambers of commerce. We offer a complete preparation in terms of quality, our teachers have the title of DELE examiner and know the structure of the test, we have teaching materials developed by our teachers (with the DELE structure) to prepare the exam and you will benefit from our interactive and innovative methodology. Who can participate in our preparation for the DELE exam? Students with a certain level of Spanish who want to prove it. People who want to study at University in Spain. Students after a course of 8-36 weeks long in Alhambra Instituto. People who are looking for a job in Spanish speaking countries. People who want to teach Spanish as a second language. Teachers of primary schools and institutes outside Spain. 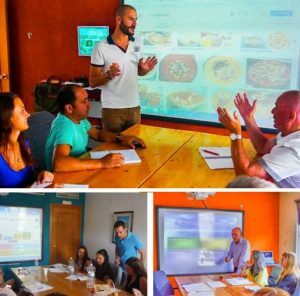 The course consists of 25 lessons a week: 20 group lessons (intensive course DELE, with maximun 10 students in the class) and 5 private lessons to prepare for the DELE exam.